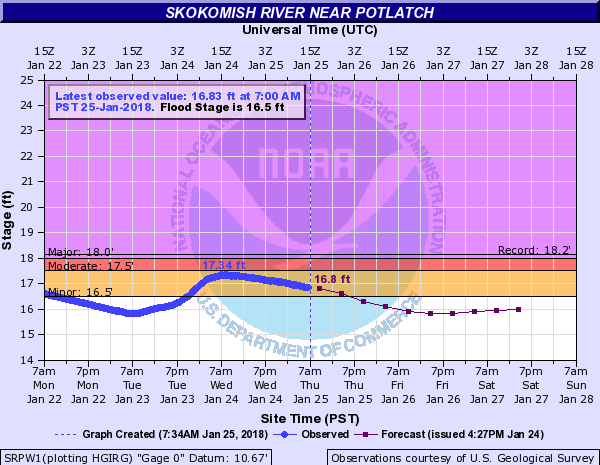 A flood warning remains in effect for the Skokomish River near Potlatch but the River is receding slowly and will be below flood stage this evening.The flood warning will remain in effect until late tonight (Thursday). Minor flooding continues in the Skokomish Valley and Skokomish Valley Road was closed to all through traffic at the intersection with Eells Hill Road (approximate milepost 3.749) due to flooding until this morning. A wetter and milder air mass is expected late this weekend or early next week, resulting in periods of heavy rain and rising snow levels. Strong southwest winds will also result in the heaviest rains falling on the southwest-facing slopes of the Olympics and Cascades. The current forecast, for the 48 hour period ending 4 PM PST Monday, calls for total rainfall amounts in the 7 to 12 inch range on the Olympics and the 4 to 9 inch range in the Cascades. The lowlands are anticipated to receive 1 to 4 inches of rain during the same time frame. This amount of rain on top of what has already fallen, and what is expected the next couple of days, could lead to flooding on many rivers as well as urban and/or small stream flooding. In addition to the potential for flooding, the landslide threat will continue to increase. Periods of heavy rain later this weekend on top of nearly saturated soils would only help to significantly increase the threat of landslides. Confidence is higher that an atmospheric river will become aimed at western Washington late this weekend into early next week. However, confidence in the details (location, timing, and exact amount of the heaviest rainfall) were still somewhat low.